Where to find UHT milk ? UHT milk can be found in most Canadian supermarkets. It is usually located in the bakery isle near the milk powder. It could also be labelled dairy beverage, milkshake or other diary product name, depending what has been added or deleted to the basic milk source. $4.27 - 4.80 average at most places. (Ontario). Here are some brands and prices we found. 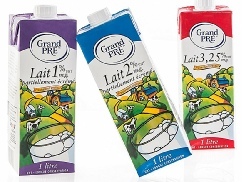 2 Lt - 2% UHT Milk. I called Parmalat to ask where their U.H.T. milk is sold. Customer service could not answer this and was unsure of the product. Must be a big seller! 1 Lt Baboo - Toddlers 1-2 years old. The suggested retail price for Baboo is $3.29 per litre and $6.99 per 6 x 250ml. 3x200ml - Individual serve $3.29 at Loblaws. Item details. Various flavoured milk. Vanilla, Strawberry and various chocolate bar selections. These single serve selections are usually found in the refrigerated section, even though they are good for 8 months. The sale price is normally $1 per unit. Walmart, No Frills, large supermarket chains and convenience stores. Although very limited here is what we have found in our search for an online supply. We are working on a list of locations across Canada. If you find UHT Milk in Canada, please let us know. 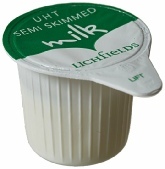 We get many requests from consumers looking for UHT milk products.